For other uses, see Tree house (disambiguation). A tree house, tree fort or treeshed is a platform or building constructed around, next to or among the trunk or branches of one or more mature trees while above ground level. Tree houses can be used for recreation, work space, habitation, observation or as temporary retreats. Even today, treehouses are built by some indigenous people in order to escape the danger and adversity on the ground. 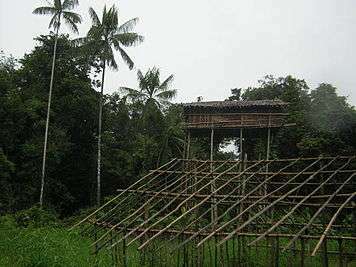 In some parts of the tropics, houses are either fastened to trees or elevated on stilts to keep the living quarters above the ground to protect occupants and stored food from scavenging animals. The Korowai, a Papuan tribe in the southeast of Irian Jaya, live in tree houses, some nearly 40 metres (130 ft) high, as protection against a tribe of neighbouring head-hunters, the Citak. Modern tree houses are usually built as a hut for children or for leisure purposes. Modern tree houses may also be integrated into existing hotel facilities. In Europe treehouses are usually built as Childrens Facilities and recently also as offices. Along with subterranean and ground level houses, tree houses are an option for building eco-friendly houses in remote forest areas, because they do not require a clearing of a certain area of forest. The wildlife, climate and illumination on ground level in areas of dense close-canopy forest is not desirable to some people. Invasive methods are all methods that use nails, screws, bolts, kingpins, etc. Because these methods require punctures in the tree, they must be planned properly in order to minimize stress. Not all species of plants suffer from puncture in the same way, depending partly on whether the sap conduits run in the pith or in the bark. Nails are generally not recommended. A new development called the treehouse attachment bolt (TAB) can support greater weights than earlier methods. Since the mid-1990s, recreational tree houses have enjoyed a rise in popularity in countries such as the United States and parts of Europe. This has been due to increased disposable income, better technology for builders, research into safe building practices and an increased interest in environmental issues, particularly sustainable living. This growing popularity is also reflected in a rise of social media channels and websites specially dedicated to featuring remarkable tree houses around the world. Many areas of the world have no specific planning laws for tree houses, so the legal issues can be confusing to both the builder and the local planning departments. Treehouses can be exempt, partially regulated or fully regulated - depending on the locale. In some cases, tree houses are exempted from standard building regulations, as they're considered outside of the regulations specification. An exemption may be given to a builder if the tree house is in a remote or non-urban location. Alternatively, a tree house may be included in the same category as structures such as garden sheds, sometimes called a "temporary structure". There may be restrictions on height, distance from boundary and privacy for nearby properties. There are various grey areas in these laws, as they were not specifically designed for tree-borne structures. A very small number of planning departments have specific regulations for tree houses, which set out clearly what may be built and where. For precaution of safety during the tree house construction, it is usually best to do as much work as possible on the ground and also concerned be about its long-term viability. ↑ "Architecture Thesis, bachelor degree". ↑ "Garden Tree House Design". Cheeky Monkey Tree Houses. Retrieved 22 March 2013. ↑ "Tree injury". Retrieved 2011-05-12. ↑ "Diamond Pier". Retrieved 2011-05-12. ↑ Bahamon, Alejandro (2007). Treehouses Living a Dream. New York, NY: Collins Design. p. 8. ISBN 0-06-078001-0. ↑ "friction fastening advice". Retrieved 2011-05-12. ↑ "Danger of nails". Retrieved 2011-05-12. ↑ Henderson, Paula; Adam Mornement (2005). Treehouses. London, UK: Frances Lincoln Ltd. p. 7. ISBN 0-7112-2437-4. ↑ "Treehouses around the world on a map". Treehouse Map. Retrieved 2016-06-17. 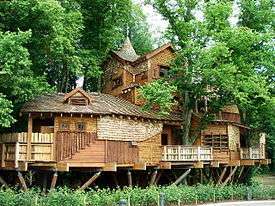 ↑ "Commercial treehouse builder list". Retrieved 2007-11-20. ↑ "Best treehouse hotels on booking.com in 2016 - Treehouse Map". Treehouse Map. 2016-06-16. Retrieved 2016-06-17. ↑ Henderson, Paula; Adam Mornement (2005). Treehouses. London, UK: Frances Lincoln Ltd. p. 65. ISBN 0-7112-2437-4. ↑ "List of Treehouses in Kerala, India".